As I look to become more healthy I am trying to make small changes to my diet. Apart from my love for water (which is a big healthy thumbs up), when it comes to hot drinks my bad habit is coffee. Therefore I am swapping coffees to herbal teas, in particular green tea, which not only provide a more gentle energy hit but also contains antioxidants among other fantastic health benefits. It is that time of year when all I want to do is snuggle in a corner of the sofa, watch a good film and sip on a yummy hot drink. 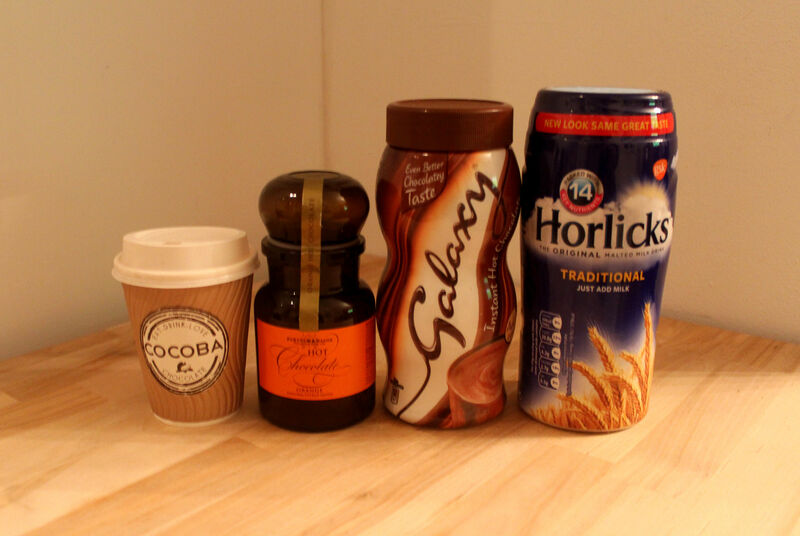 Here I have tried four different hot drinks (predominantly hot chocolate), which range in price and include both pre-made or do-it-yourself. As the days have gotten dark and cold my health plan has gone out of the window. The promise of a comfy sofa in front of an episode of Made in Chelsea is much more appealing than heading to the gym. Hot chocolate has replaced fruit juices and it’s time to get my health back.